At McManus Kitchen and Bath our goal is provide a wide range of products and services to fit most peoples kitchen and bathroom remodeling needs and budget. One of those services is called Cabinet Refacing. Cabinet refacing can be a great way to update the look and function of your kitchen quickly and more economically than traditional cabinet replacement. Replacing you cabinet doors and drawer fronts with new, solid wood doors and drawer fronts. When your refacing project is complete, the entire exterior of your cabinets are all new, high quality wood finishes and trims. We get our refacing materials from Cabinet Cures of Portland OR. They have have been providing refacing materials for more than 20 years to dealers all over the US. We are not a franchise and pay no franchise fees or marketing fees to Cabinet Cures. We are not required by contract to sell only Cabinet Cures products, we choose to use Cabinet Cures because we believe they are the best provider of refacing materials in the US. We carry cabinets from Fabuwood and Yorketowne. We also plan to add Jay Rambo cabinets in the near future. Yorketowne cabinets are made in the USA and offer semi-custom and custom cabinets. Fabuwood is a imported cabinet that comes in stock sizes. We chose Fabuwood for the quality of their finished and hardware. They are a great quality cabinet at a very good price point but their doors styles and custom options are limited. Jay Rambo, a full custom line, cost about 70 percent more but they can literally make your wildest cabinet dreams come true. Which cabinets to compare refacing to? So the challenge in comparing refacing to replacing is deciding which cabinet line to compare it to. Refacing will typically be 20% less than new Fabuwood Cabinets but can be 40% less than Yorketowne and 100% less than Jay Rambo cabinetry. 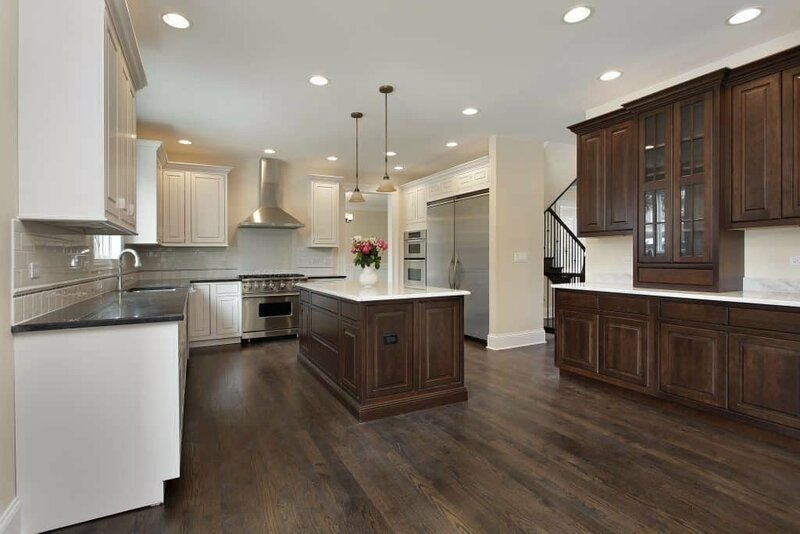 All your refacing materials are custom made and and we often modify and customize your cabinets as part of the refacing process so to some degree it makes sense to compare them to custom cabinetry. But realistically I think it makes more sense to compare the cost of refacing to a stock or semi-custom cabinet cost. For this article we are going to use Fabuwood cabinets, as they are our most economical cabinet line but still have finishes and hardware that are comparable to more expensive cabinets. A typical medium sized kitchen, like the one pictured above, costs $12,000 – $15,000 to reface, including a few custom options like pullouts and organizers. New Fabuwood cabinets, for the same kitchen would cost $18,000 – $20,000,installed. But that is just for the cabinets. With new cabinets you also have to replace the counter tops, sink and faucet as well as pay for removal of the existing cabinets. That increases the cost to $25,000 – $30,000. Most cabinet refacing projects are complete within a week. New cabinets can take 3 – 5 weeks or more, depending on the extent of the repair work needed after the demo is complete and the lead time on your new counter tops. With refacing there is very little disruption to your daily routine. All work is done in house by our team, and there is no real demo needed. Your counter tops and appliances stay in place and you can keep using your kitchen throughout the process. When we replace cabinets we do an excellent job of controlling dust and managing the schedule so that it minimizes the disruption to your daily routine (we call this livable remodeling). But you do lose the use of your kitchen for the entire project and more sub contractors are needed. When we come out to give you an estimate we will discuss your options with you and help you decide which is the best solution for your needs. There are times when refacing is clearly the best and others when new cabinets are the way to go. But often the decision falls into a grey area the really depends your budget and you goals for the project and your home. You want to change the layout of your kitchen – with refacing you can make minor layout changes but significant changes require a lot of custom modifications and that can get expensive. Sometimes its harder to say whether you should refacing or replace your cabinets. One of the main advantage of cabinet refacing is how quick it can be done and that it does not require removing your counter tops or appliances. If you are already planning to replace those items anyway, replacing your cabinets could be a better option depending on your goals. If you are replacing your counter tops and flooring anyway. – if you are already planning to replace your counter tops, flooring or other items as part of your project then the decision become a little harder. We would recommend doing an estimate for each and looking at both options. If you have any questions about cabinet refacing or would like to discuss options for your project please give us a call.